I was doing LIVE weather hits from the Ohio Statehouse tonight. Santa and some kids light the tree up tonight. 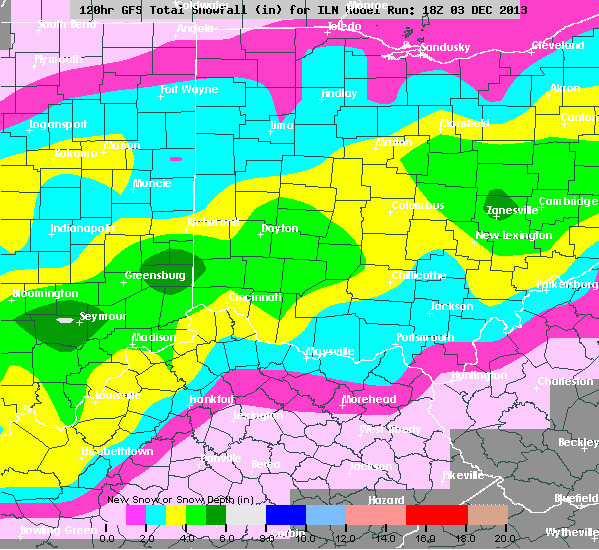 Still going over the forecast models, but so far, I am agreeing with the above GFS model the most. It is generally calling for about 2-4" for most of Ohio, but a little less by Toledo because they will be too far north and a little less down by the Ohio and West Virginia border because they will be warmer and result in more ice and rain instead of snow. Isolated higher pockets will be expected for Friday and Friday night, but don't take this map for what it is worth. 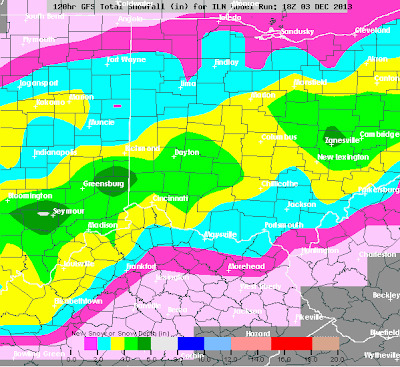 The NAM model has the heaviest snow up by Lima and Findlay and the Euro has the heaviest snow closer to the Ohio River than Central Ohio. Here is how everything is looking. Wednesday will be warm with most of Ohio getting into the 60's thanks to a strong Southerly breeze. An isolated shower or two, but generally staying dry most of the daytime hours. More rain arrives Thursday as the cold front pushes through and that is when our temperatures will start to drop. Temps continue to drop Thursday night as the front stalls out along the Ohio River. This is when it gets interesting. As temps fall Thursday night, areas along the front will see a wintry mix including some freezing rain. The above loop is the NAM model through Thursday night. The front will slowly push more Northwestward Friday and bring the ice and wintry mix further NW. There is a low pressure system riding up the front from the SW. That is what will be bringing the moisture for Friday. It all depends on how far the front rides NW Friday as to who will see the most snow. If the front slides all the way back to Columbus and we get into much wintry mix (including freezing rain and sleet) then the snow totals will be cut down farther. This pulls out Friday night and we are dry Saturday followed by another wintry mix Sunday night into early Monday. Be sure to check back in to the blog for updates on this... also... I spent about 90 minutes on the phone today trying to renew my domain (StuckInTheBuckosphere.com), but was having no luck because Google changed their settings and I can't prove that I am the admin for the page. I will be spending more time tomorrow trying to get it resolved, but the domain may be taken away and I may have to switch things up. I was really frustrated today because it should be something simple to do, but apparently you can only talk to computers when you call Google tech help. No humans. Ugh! Anyway... I will be back to keep you guys updated. Have a good one!